The Predator had a bumpy ride before it even made it to the big screen, but the Shane Black-helmed film was able to secure the number one spot at this weekend's box office, earning just over $24 million in its debut weekend. The sci-fi thriller was only projected to make about $26 million, so it came in way under expectations. 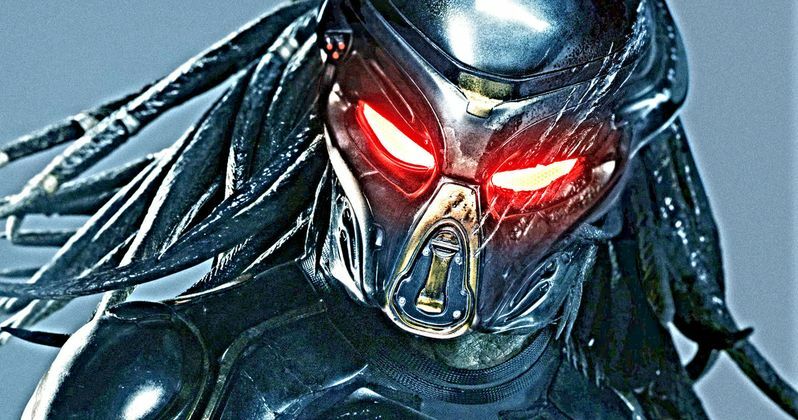 However, overseas, The Predator brought in an additional $30.7 million, bringing its worldwide opening to $54.7 million. The Nun took in an impressive $18.2 million in its second weekend at the box office, which was plenty enough to take the second spot. A Simple Favor debuted at number three this weekend, earning $16 million. The black comedy mystery thriller stars Blake Lively and Anna Kendrick, who have both been getting great reviews for their performances. The number four spot for the weekend went to the debut of White Boy Rick, which took in $8.8 million. Matthew McConaughey stars in the film, which has received decent reviews from some critics and has been called "so bad it's good," by several others who went to theaters over the weekend to see it. Crazy Rich Asians brought in another $8.7 million this weekend, taking the number five spot for its fifth weekend. Overall, the movie has earned $187.4 million worldwide, and it continues to be very popular. Number six went to Jennifer Garner's action-packed revenge film Peppermint, which took in $6 million this weekend, falling 54.8 percent from last weekend. The movie currently holds a 12 percent Fresh Rating on Rotten Tomatoes. Jason Statham's end of summer popcorn movie The Meg is still holding strong, having brought in $3.8 million this weekend to earn the number seven spot. Domestically, the giant prehistoric shark-starring film has earned $137 million to date and $368. 2 million overseas, for a combined $505.2 million in the six weeks that it's been in theaters. Searching took the number eight spot at this weekend's box office, bringing in $3.2 million. The John Cho-starring movie was added to additional theaters last week and has been getting rave reviews from fans and critics. The Film currently holds a 92 percent Fresh Rating on Rotten Tomatoes. Rounding out the top ten this weekend is Unbroken: Path to Redemption and Mission: Impossible 6, both earning $2.3 million and taking the ninth and tenth spots, respectively. Unbroken: Path to Redemption is a "spiritual" sequel to Angelina Jolie's 2014 film Unbroken, but does not include the actress and did not use the same studio this time around either. Mission: Impossible 6 fell from number six last week to number ten. You can check out the rest of this weekend's box office numbers over at Box Office Mojo.